Sponsorship opportunities for INBADD are now open! Please consider supporting the only Business Analysis conference in Indiana. We draw Business Analysts, Project Mangers, and Business Analyst Managers from Indiana, Illinois, Kentucky, and Ohio. This is our 3rd Annual conference and our attendence continues to grow. Each level has designated benefits. There are 5 Gold level sponsors, 10 Silver Level Sponsors, and 10 Bronze Level Sponsors. 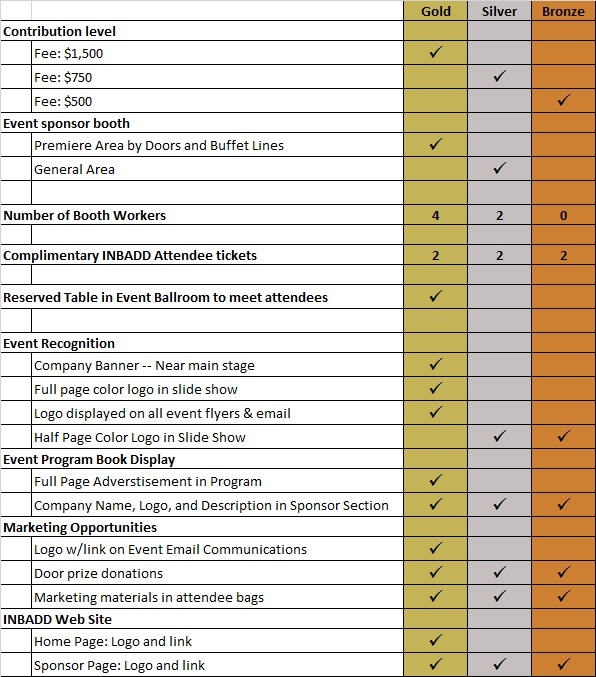 Please note that Bronze Level Sponsors do not get a booth/table area. You can reserve your table number (location is approximate) when you register for the event. We have turned on reserved seating in EventBrite. It is very much like buying reserved seating at a concert.